on the publication of her latest book of poetry; Wormwood, Earth and Honey, published by Circaidy Gregory Press ISBN 9781906451042. I have found myself going back to several of the poems in Wormwood, Earth and Honey already. I have also read the other reviews on Catherine's website and agree that her writing is delightful and multi-layered. I would say what stands out for me is the comedy (in some). The depth, quality and/or quirkiness of each piece also holds me captivated. 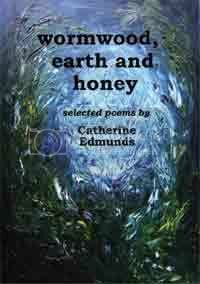 So, like a good CD, film or story that can be heard, watched or read over and over again, pleasure is added to with each reading of Wormwood, Earth and Honey by Catherine Edmunds. About ten years back I was introduced to the short stories of Glasgow writer James Kelman. Brian Gillespie, a respected member of Sensitize © was reading a lot of his work and Brian and myself were drinking buddies and rambling philosophers on many topics. Anyway, one night over a few beers Brian shared (read) Constellation by Kelman to me. I was transfixed by the piece. I read it myself twice that night and then maybe once a day for the next five. I caught a fever of a desire to dip my toe in and write short stories of my own. My earliest sadly gone because of the destruction of an MSN group I ran called Sensitize ©. Ah well, ho hum. It's in the past now and I've written newer short stories that I'm much happier with since. Kelman was my muse and catalyst into the form though, as of course was Brian who shared a lot of his own early work with me while sharing his admiration for Mr. Kelman and Ireland's own, Bernard McLafferty. guardian.co.uk wrote: "Former Booker prize winner James Kelman has won the Saltire Society's Scottish book of the year award for his novel Kieron Smith, Boy, which is told from the perspective of an 11-year-old Glaswegian child. Kelman was the judges' unanimous choice from a strong shortlist that included Mick Imlah's Forward prize-winning poetry collection The Lost Leader; Ali Smith's retelling of the myth of Iphis and Ianthe, Girl Meets Boy; and Andrew O'Hagan's essay collection, The Atlantic Ocean. The Saltire award is given to a work either by a writer with a Scottish connection, or with a Scottish subject. Chair of judges Ian Campbell said Kelman had "caught and ventriloquised" the essence of a boy from Glasgow. "It's an exceptionally sensitive reflection – his ear is tuned to perfection," he said. "We liked it for its reflection of Glasgow life, and for the way it summed up so many of Kelman's gifts." Nice one Brian and well played James Kelman for your book; Kieron Smith, Boy. I read most of No Time For Love by Hugo Meenan back in the searing heatwave of 1995. I was registered as homeless at the time having been the victim of crime in which my home was smashed to pieces by wannabe paramilitaries. So I was residing in a hostel on the Waterside of Derry. I was sitting in the Dungloe Bar - Waterloo Street feeling really low and Hugo walked in with another dear friend of mine, Liam Hillen. When Hugo learned that I was homeless and had been facing a lot of sectarian hatred from a few (Loyalist) fools out at the hostel where I was staying he told me that I had to go with him to where he lived to chill out for a while and recharge my energy levels. We did. At that time Hugo lived with his partner, a wonderful lady called Valerie in a large farmhouse in Donegal at Newtoncunningham on the way to Letterkenny. When he told Valerie about my situation she made me a meal and said I could go have a bath and if I wanted my clothes washed, to leave them out for her. Later that evening as we all sat in their livingroom Hugo handed me a copy of his book and explained a little bit on how it came about. Then he recommended I have a read of it. Both Valerie and Hugo went out of their way to make me feel relaxed and soon I became completely engrossed in No Time For Love. The story while fictional is centred on the experiences of a young male character who gets caught up in the conflict raging in the North of Ireland against the British Crown and its forces of occupation. Places and settings were all very familiar to me having grown up in Derry during the worst of the war and I identified in no small way with the central character and his story. Hugo's writing style is highly captivating and at times I felt like I was listening to the book rather than reading it. Sublime and superb are two words I would use when describing his narrative form. I read chapter after chapter not wanting to put it down. Eventually though tiredness got the better of me and I fell asleep. The next morning however, I was back at the book while Hugo (a practitioner of Tai Chi and yoga) meditated in the morning sun out on his doorstep. Unfortunately I didn't get the chance to finish reading it because Hugo was called upon by one of his neighbours to assist him in chasing a big bull from one field to the next and away from the cows. So, we both ended up doing that, then walking a few miles to the nearest filling station where we waited for a bus back up to Derry. I am absolutely gagging to read No Time For Love by Hugo Meenan again. The man and his lovely partner literally saved my life. They gave me a little hope at a time when I was at breaking point and I will never forget their kindness and their genuine respect for my poetry which I shared with them because it was all I had to contribute that night. Valerie and Hugo: If you are ever reading this review, please know that I have the deepest admiration, gratitude, love and respect for the two of you.